Who loves Rustic Sourdough Bread? I do, and have always wanted to give a go on baking my own. 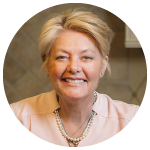 Do you have anything special you’ve always wanted to prepare but the timing never seems to avail in life’s busy schedule? One of the challenges in accomplishing from among my long time desired preparations of Rustic Sourdough Bread was the ‘mother,’ that is, the ‘mother’ sourdough starter needed in order to even begin preparing Sourdough. 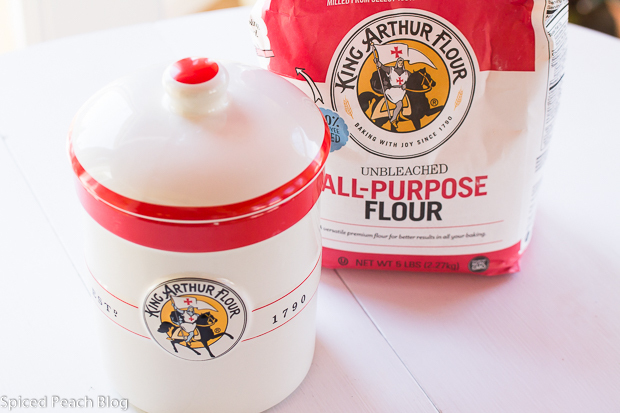 Recently, King Arthur Flour sort of sealed the deal towards me fulfilling one of these, my ‘bucket list check-off of food preparations,’ offering for free, the cutest little bright colored canister as shown above, if, you purchased their sourdough starter. Wahoo! I felt like I really hit the ‘mother-load,’ for though admittedly being one of those ‘downsizer’ people always clearing out the clutter, there was something special about this canister that caught my eye, reminding me of one of those kitchen pieces folks keep long-term, pass along, sort of like my late Aunt Elizabeth’s old ceramic mixing bowl, easily over fifty years old, that sits on my counter as a napkin holder. Now with Rustic Sourdough Bread, even once you have the ‘mother starter,’ there are a whole series of preparations required, rapidly moving forth in the ‘feeding’ process once your Starter has arrived. It is all quite easy, but nevertheless, requires attention over an extended number of hours. There are really only 2 ingredients you need to deal with other than the starter, lukewarm water & flour. Step one is a wait time of 8-12 hours, step two is 2-4 hours, and later another 2-4 hours, then your sourdough starter is ready to use for preparing Rustic Sourdough Bread, a round Boule, some Pizza Crust, any among a series of recipes in the King Arthur Flour Sourdough Tips and Recipes booklet that comes along with your little container of sourdough starter. Once your sourdough starter is prepared and used in a recipe, you refrigerate the rest loosely covered, and only need to feed it once a week, just like a plant. On the down side, if you forget, to feed your starter, you need to begin the whole process again, as I have already forgotten, only the second week in. Still, what a thrill. I finally did it, eh, I could use a bit more practice, but not too bad at all, very, very delicious, pulled hot from the oven, lightly sour scented, deep golden, and crusty, my very own Rustic Sourdough Bread, First Loaves. Combine all of the ingredients, kneading to form a smooth dough. 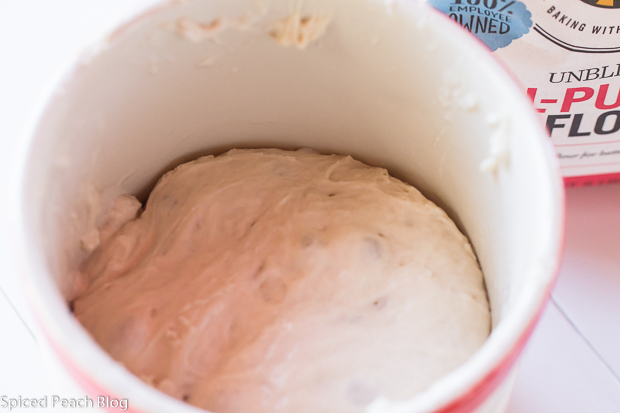 Allow the dough to rise in a covered bowl, about 90 minutes until doubled in size. Gently divide the dough in half, the dough will deflate a bit. Gently shape the dough into two oval loaves, or 2 long logs. Place the loaves on a lightly greased or parchment lined baking sheet. (I used a parchment lined baking stone.) Cover and let it rise until , about an hour. Preheat oven to 425 degrees about 40 minutes later to bring oven to a consistent hot temperature. Spray the loaves with lukewarm water. Make two fairly deep diagonal slices into each loaf using a serrated bread knife. Bake the bread for 25 to 30 minutes until the bread is a very deep golden brown. Remove from oven and cool on a rack. 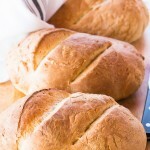 This entry was posted in Breads and Muffins and tagged King Arthur Flour, King Arthur Flour Sourdough Starter, King Arthur Rustic Sourdough Bread Recipe, Rustic Sourdough Bread. Bookmark the permalink. Post a comment or leave a trackback: Trackback URL. YUM! We love sourdough bread. We get it from a local bakery. Doesn’t it make the best toast? The canister is adorable. You can take baking classes at the King Arthur Flour Factory in Vermont…maybe a road trip is in your future. 😉 I can almost smell it, Peggy. Hi Kelly, wow, you’ve got me inspired on the King Arthur Factory, they also offer some unique classes online as well. Yes, the sourdough does make the best toast, and I am a fan of a crusty outer crust which this bread provided. The canister is adorable, it makes me smile. Silly, the things we like sometimes. Peggy… It looks delicious and no doubt tastes even better. Just add butter for a heavenly treat. Thanks so much Dad! It was a worthwhile endeavor, and look forward to preparing more in the future! Hi Peggy, good for you creating your own starter. I have been very curious about this process, looks like it is worth the time. Lovely looking bread. Hi Cheri, if you get the actual Sourdough Starter from King Arthur Flour than all you need to do is the ‘getting it started process’ which of course, does take some hours of preparation but the work involved is minimal. Once the mother is ready, putting together the bread is an actual breeze. I suspect that you would really love this and hope you give it a go! Thanks much and see you soon. These look beautiful Peg, you know I won’t even begin attempting this one but then I wouldn’t mind a loaf next time they come out of the oven, lol. Thanks Meredith! I’ll see what I can do when preparing the next batch! I love that cute little canister! Perhaps something like that would be the incentive I need to finally get on the sourdough wagon. It’s been on my ‘to do list’ for a few years now. 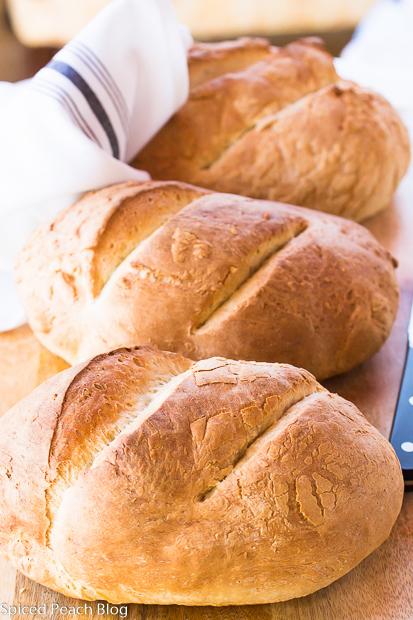 Having bread that beautiful would be another incentive (and reward). Hi Teresa, Thanks so much. Yes, the canister is quite cute and I love its colorful look. I do hope you give the sourdough a try, it is quite delicious and so easy to put together once you go through the seasoning process. Having beautiful (and delicious) bread is is definitely a noble incentive toward the ‘to do’ among cooking techniques!